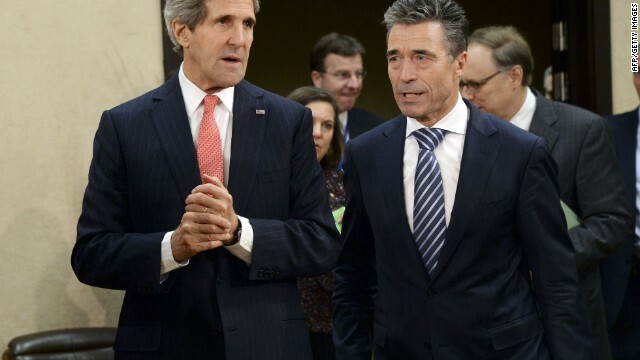 Secretary of State John Kerry speaks with NATO Secretary General Anders Fogh Rasmussen, prior to the NATO Foreign Affairs Ministers meeting held at the organisation's headquarters in Brussels, on December 3, 2013. NATO warned it may be forced to withdraw all of its troops from Afghanistan by the end of next year if President Hamid Karzai doesn't sign a security agreement with the United States. 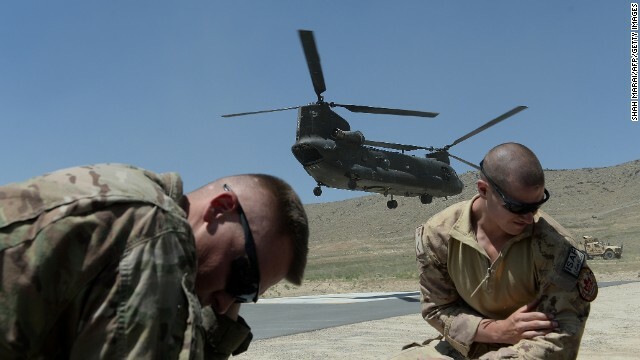 Reached last month, the pact lays out the U.S. military presence in Afghanistan after 2014, when the NATO-led force of some 80,000 troops is scheduled to leave. 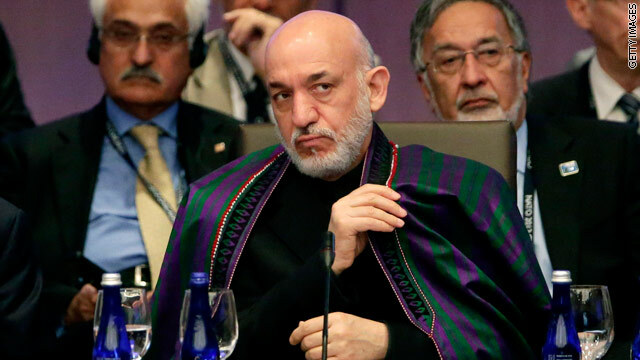 Although the agreement was endorsed by the Afghan council of tribal leaders, called the Loya Jirga, Karzai said he won't sign it until after elections in April. 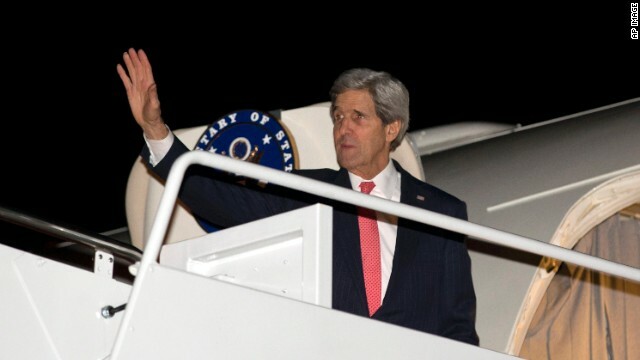 Uncertainty over the agreement is causing mounting anxiety among diplomats here, where Afghanistan is dominating talks among NATO ministers, including Secretary of State John Kerry. Tiny Moldova to get big boost from U.S.
It’s a short stop – just four hours – on a trip that will take Secretary of State John Kerry to a NATO meeting in Belgium, to Israel and to Ramallah in the West Bank. But his visit to Chisinau, capital of Moldova, is significant. The Eastern European nation, bordered on the east by Ukraine, stuck to its diplomatic guns late last month and, along with Georgia, signed a key economic and political agreement with the European Union. That agreement, called the “Eastern Partnership,” is designed to forge closer E.U. ties with Ukraine, Belarus, Moldova, Azerbaijan, and Georgia. As Defense Secretary Chuck Hagel prepares to fly to Brussels on Monday for a meeting of NATO defense ministers, the question of how many U.S. troops might remain in Afghanistan after 2014 is still unanswered. But indications are emerging that it may be a relatively small number of troops that stay behind. Several military and Pentagon officials tell CNN that a central option now being considered calls for a total NATO force of between 8,000 to 12,000 troops, with 3,000 to 4,000 coming from NATO countries, and the United States making up the balance. While the final numbers could change, one senior Defense Department official said it's not likely to change by much. If fewer than 8,000 were to stay, relatively few would be able to engage in actual missions. An Israeli web site only has one question: Has the attack happened yet? The one-word answer: No. The joke in Israel is that everyone keeps turning to the site, which has more than 17,000 likes on Facebook, to see if the answer has changed to "yes." An Israeli dental clinic has also gotten into the game with a full-page ad for dental implants. Under a picture of President Obama, the question: "Got teeth?" As it tries to build international support for action against the regime of Syrian President Bashar al-Assad for its alleged chemical attack, the Obama administration must confront an increasing lack of confidence among its allies. While billed as an effort to strengthen U.S. resolve, diplomats say President Barack Obama's decision to seek authorization from Congress is playing out as weakness in a region concerned that Obama would show similar indecisiveness if faced with a nuclear Iran. The Obama administration believes it will reach a deal with the government of Afghanistan that would allow American troops to remain in the country after the current NATO mission ends next year, the top U.S. diplomat in the region said Thursday. The disclosure follows reports this week the administration was seriously considering an option of leaving no forces in the country after 2014. 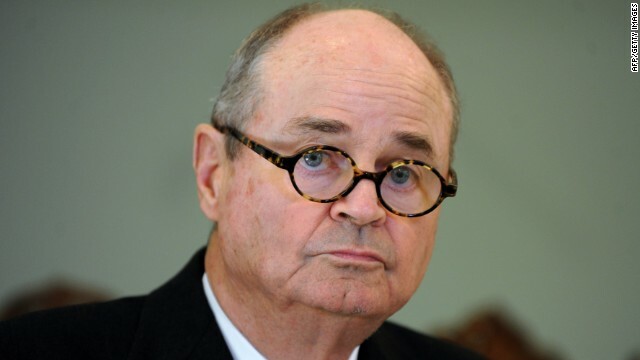 "We do not believe that that's the likely outcome of these negotiations," James Dobbins, special envoy for Afghanistan and Pakistan, told the Senate Foreign Relations Committee. Pressed about reports on the so-called "zero option," Dobbins labeled them "unbalanced and unhelpful." 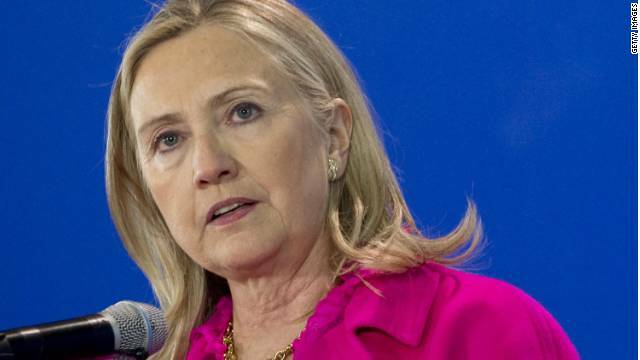 Hillary Clinton: NATO risks sliding into "military irrelevance"
A NATO alliance where member nations are hamstrung by political and economic difficulties may be a militarily weakened one, former Secy. of State Hillary Clinton warned Wednesday night. "NATO is turning into a two-tiered alliance with shrinking percentage of members willing – and able – to pay the price and bear the burdens of common defense," Clinton said. "Even in these difficult economic times, we cannot afford to let the greatest alliance in history slide into military irrelevance." Clinton was speaking at an annual Atlantic Council awards dinner in Washington where both she and NATO Secretary General Anders Fogh Rasmussen were honored with Distinguished Leadership awards. Clinton praised Rasmussen roundly for his work. But she didn’t shy away from the idea that NATO nations needed to think ahead about a more evenly-shared responsibility when it comes to security and readiness. 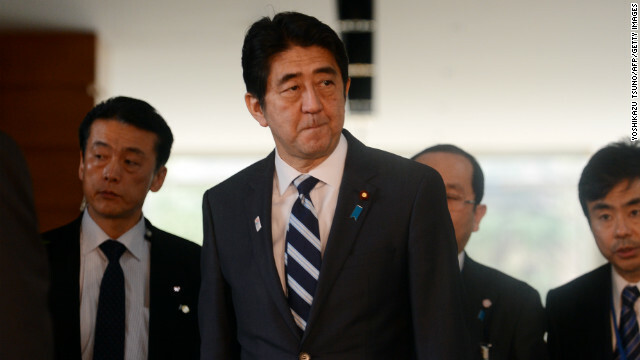 Japanese Prime Minister Shinzo Abe leaves his official residence after attending a security council meeting in Tokyo on Tuesday. "This is a highly provocative act that ... undermines regional stability, violates North Korea's obligations under numerous United Nations Security Council resolutions, contravenes its commitments under the September 19, 2005 Joint Statement of the Six-Party Talks, and increases the risk of proliferation. North Korea's nuclear weapons and ballistic missile programs constitute a threat to U.S. national security and to international peace and security. The United States remains vigilant in the face of North Korean provocations and steadfast in our defense commitments to allies in the region." "The danger posed by North Korea's threatening activities warrants further swift and credible action by the international community. The United States will also continue to take steps necessary to defend ourselves and our allies." 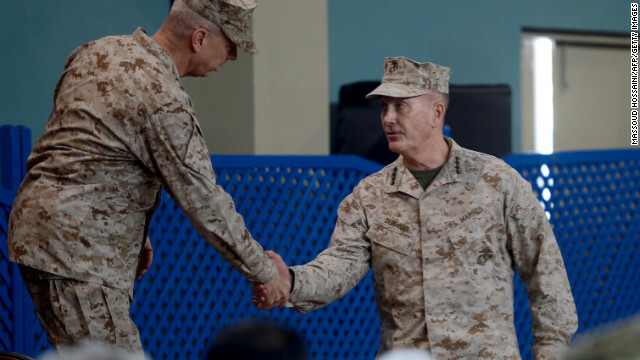 U.S. General Joseph F. Dunford (right) pictured with former NATO commander U.S. General John Allen in Kabul. U.S. Marine Gen. Joseph Dunford took command Sunday of the NATO-led International Security Assistance Force in Afghanistan, where he will oversee the final two years of the war and the withdrawal of nearly all troops. "Today is not about change, it's about continuity," Dunford said at a change-of-command ceremony in Kabul attended by his predecessor Marine Gen. John Allen and other senior NATO and Afghan officials. "I'll endeavor to continue the momentum of the campaign and support the people of Afghanistan as they seize the opportunity for a brighter future." Dunford replaces Allen, whose final days as ISAF commander were marred by an investigation linked to the scandal that led to the resignation of his predecessor David Petreaus as the director of the CIA. 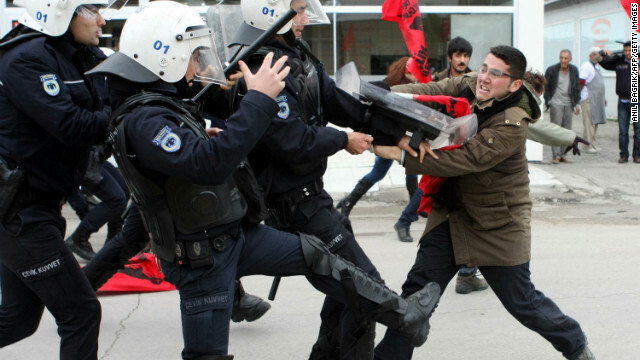 A leftist clashes with Turkish policemen during a January 21 protest in Adana against NATO's installation of Patriot missiles. The first of six Patriot missile batteries intended to protect Turkey from Syrian threats is operational along the countries' shared border, NATO said Saturday. The other five batteries, which NATO says are to be for defensive purposes only, are expected to be in place in coming days. NATO foreign ministers decided in December to deploy the batteries after Syria launched Scud missiles near the Turkish border. In October, errant Syrian artillery shells hit the Turkish border town of Akcakale. The Obama administration's plan to solidify the number of U.S. troops that will be left in Afghanistan after the NATO-led operations end in 2014 should come into greater focus this week as Afghan President Hamid Karzai visits Washington. With conversations scheduled at the State Department on Wednesday, the Pentagon on Thursday and the White House on Friday, Karzai should get a better sense of how the United States plans to maintain the relationship with his nation in the future. At the Pentagon, Karzai will be briefed on the plans to keep thousands of U.S. troops in Afghanistan to fight insurgents and to continue to train Afghan Security Forces. But that plan hinges on what Karzai may want from the United States, according to Defense officials. It's no secret that Karzai wants total Afghan control of detention operations, meaning all Afghans being held by the United States and NATO allies would be turned over to Afghan authorities immediately.